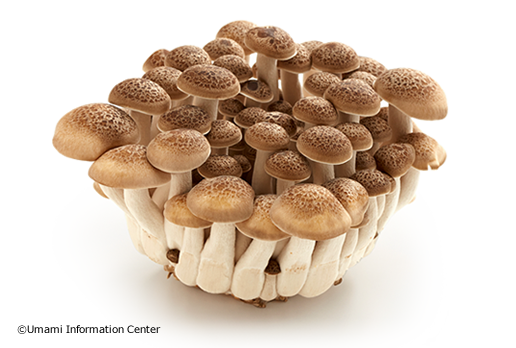 Shiitake mushrooms, Japan’s most popular mushroom, have a strong, earthy smell and are used fresh or dried in cooking When the mushrooms are dried, their guanylate content increases, while the drying process allows concentration and provides glutamate, thus boosting their umami flavor. 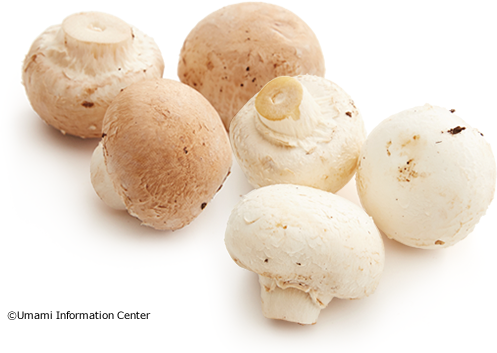 Fresh shiitake mushrooms are abundant in glutamate. Dried shiitake mushrooms are re-hydrated and mainly used for simmered dishes. The liquid from re-hydrated dried mushrooms is widely used to make dashi. 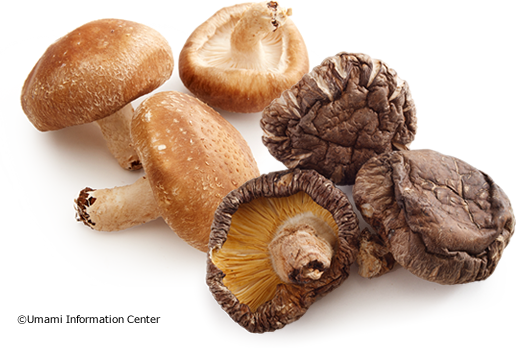 Fresh shiitake mushrooms are widely used for such things as grilled, deep-fried and fried dishes. There is a saying that “matsutake mushrooms have the best aroma and shimeji mushrooms have the best taste.” Tasty and crispy, shimeji mushrooms are edible fungi with a good shape and color and are rich in glutamate. 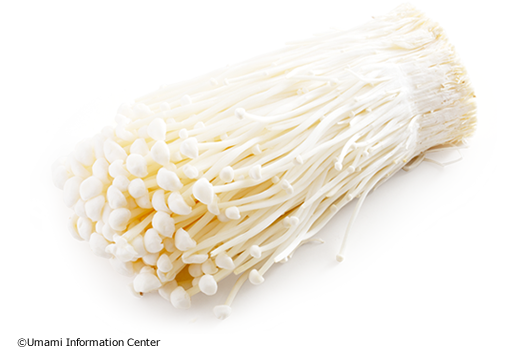 There are various Japanese recipes using shimeji mushrooms such as shimeji pilaf, clear soup, baked and deep fried. This mushroom, an indispensable ingredient in traditional Japanese nabe stew dishes, contains the umami compound guanylate. For example in the nabe dish called sukiyaki it is possible to enjoy in one dish the synergistic effect of umami caused by the combination of inosinate from beef, glutamate from hakusai (Chinese cabbage) and the guanylate of the enoki. This ingredient can be used to increase the umami in a whole host of dishes. Common Mushrooms (Agaricus bisporus) originate in Europe and are the most cultivated fungus in the world. They have two color states while immature?white and brown?both of which have various names. White ones are served as cooked or raw while brown ones are normally served as cooked. Their umami substance is glutamate. There is little guanylate in fresh fungi. Truffles are considered to be one of the worldﾕs top three delicacies. This fungus is relished as much for its aroma as its taste, and because it is very difficult to cultivate, it is famous for commanding high prices. 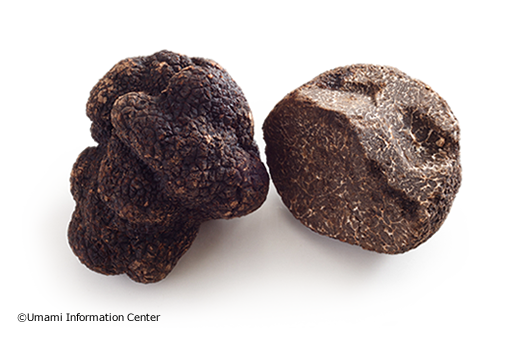 In its native France and Italy, traditional dishes that use the truffle are much loved. They are abundant in glutamate.